It's been almost three weeks since my last blog post. I honestly have no good excuses for this! Nonetheless - I have been keeping up with the new winter releases and figured it would be a good idea to give my thoughts on a few of my favorites. When I hear the name American Crafts, two things usually come to mind. Thickers and Amy Tangerine. Both of which I am completely addicted to. 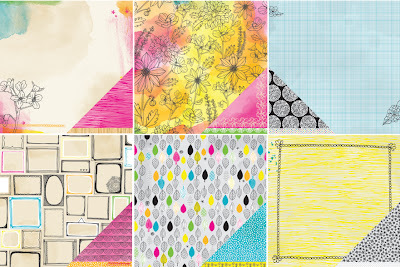 I adore Amy Tangerine's new line - "Sketch Book". The papers, the embellishments. I love everything about this collection! Even the 12x12 album. The collection has the appearance of water colors and it gives off a very artistic look. Amy Tangerine never disappoints! New releases/new collections means new styles of Thickers. I know I speak for everyone when I say that Thickers are the best 'fix' for those who are addicted to alpahs. I was actually lucky enough to win a box full of American Crafts goodies, including some Thickers. I'm not sure if this box will include some of the new releases but nonetheless I am EXCITED! I mean really, what's not to love about American Crafts? If I had to name a collection that represented my personality, it would have to be Simple Stories' new collection "Fabulous". I can think of a million things to scrap about while using this collection. My daughter, myself, my best friend, my mother, my sister. It's so feminine but has successfully stayed away from the 'shabby chic' look (which I feel is a bit repetitive). The collection has a perfect balance of a retro feel and a modern day feel. The colors are vibrant and go so well together. The embellishments have to be the best part! I want to double up or even triple up on the embellishment sheet because I know I am going to find so much use for them. This collection really is FABULOUS! October Afternoon stayed true to the 'retro' feel they put into their products. While all of the collections were pretty "groovy", my favorite was easily the "9 to 5" collection. Admittedly, I am a little obsessed with office supplies. I love everything there is about office-esque work. The supplies and tools, the organization, and let's not forget - looking fancy in business clothes. When I heard October Afternoon would be doing a work/office themed collection, I nearly jumped out of my seat with excitement. I mean, really, how cute are the little secretaries with their retro typewriters? The beauty of the collection is that it doesn't HAVE to be used for work themed projects. From the projects I've seen - it's very versatile. You know I have to throw Authentique into the mix. They are, after all, my favorite company! Not only am I throwing them in the mix but I am going against the grain and doubling up on my favorites. One of the collections, "Celebrate", is from the 2012 CHA release. The combination of colors are so much fun and unique. There is a definite party theme to the collection but the paper is so versatile you can use it for ANY type of party or even non-party themed projects. Can I also just say that I am SO happy that Authentique is now selling collection kits! As for my next favorite from them - technically it is not a CHA 2012 release but it is a new release, nonetheless. It's call "Little Miracles". Oh, BABY! It's all about BABIES! Anyone who reads my blog knows that my daughter is only one year old. I have so many photos of her when she was a newborn that I have not been able to scrap because I haven't felt I found the right paper. Well...Authentique hit the nail on the head! The "Little Miracles" collection is perfect. It's exactly what I've been looking for. Soft colors, "babyish" but not TO "babyish", and what perfect little embellishments! I have to admit that I didn't know much about My Little Shoebox until recently. Their new collections can be described in one word. PRECIOUS! My particular favorite is called "Up In The Trees". The birds and hearts are especially adorable. One paper in particular really struck my fancy. The wood grain paper! It's not just your average wood grain pattern. The wood grain curves into little hearts. Cute, huh? This collection really is perfect for scrapping the hubby and I. We are 'love birds' after all. That, along with the die cut shape and 3-D flowers, was enough to win me over. Speaking of winning, I was lucky enough to win this collection from My Little Shoebox! It's arrival is highly anticipated. I can't wait to play around with it. Studio Calico really brought it this year! While they are as amazing as ever, the paper collections are not what really tugged at my heart. So what did? The stamps, the sprays, the wood veneers, and the masks! Let's start with the stamps. I don't consider myself much of a stamper but I think I could learn to love the trade with these stamps! They are modern and fresh and so versatile. Great for any project! I love how well the stamps will work when it comes to fussy cutting or even making borders using them. Mister Huey Sprays are out of this world, wonderful. They have come out with a "basics" collection in which they have brought back some of their older favorite colors and added new colors. These colors aren't going any where! They can hold a continues place in your stash. The wood veneers are probably my favorite out of the lot. These little guys are mistable making them customizable. You could even use some of the heavier ones as a mask. Speaking of masks - The Mister Huey Masks that Studio Calico has released this winter are brilliant. I think they will add a real pop to anyone's layouts or even be useful when it comes to art journaling! Last but certainly not least - Heidi Swapp! The idea behind her new release, The "File Memory Collection", is that you use file folders to store your memories instead of actual layouts. While I'm still a layout kind of girl - I love the extra embellishments that come along with the idea of the File Memory Collection. There are a lot of embellishments that allow a page to be interactive. If you have been reading my blog for long - you know that I love interactive pages. 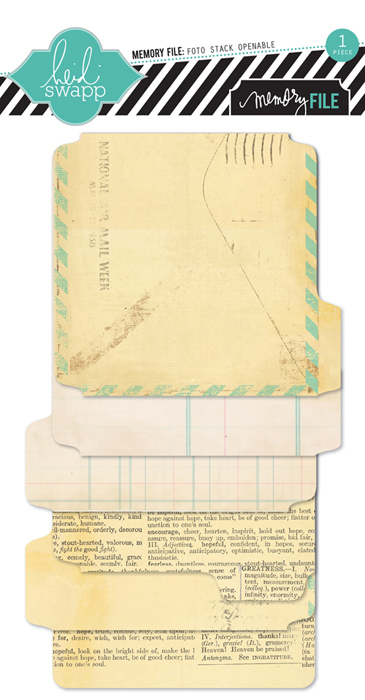 Some ideas we've seen before like the envelopes that have pull outs for journaling. There there are other ideas like the mini books called "openables" which are little books that can be added to your layout to store more photos. How perfect! Even cooler then that, though, are the Fotostack Openables. It's kind of like a staggered mini book - only one you can adhere to your layout. 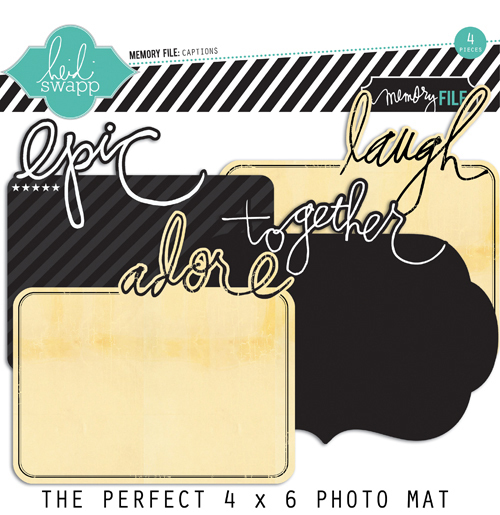 Along with her new collections come my personal favorite - the photo mats she has created using her own handwriting. I can't help but to think they would be such a fun addition to any layout. Such a unique twist on adding a title. She has come out with quite a few 'resist technique' products that allow you to take your customization even further. I personally think the resist border banner - delights look fun to play around with. And there you have it. That's just a FEW of my favorites from this winter's releases. I could name more but I'm afraid we'd be here all day. What were your favorites this year? Isn't CHA time so fun? There are so many cute new things and I am trying so hard to not spend a lot of money because I already have so much.